The Learning in the Company of Friends program will also be coming to Cleveland, Ohio , Columbus, Ohio , and Nashville, Tennessee , in early 2007. It was, for decades, a Memorial Day tradition. For 2007, however, Kenyon's annual Reunion Weekend will be held later--by one week. A survey of alumni revealed that, despite the longstanding Memorial Day weekend event date, a majority of alumni actually preferred that reunion be held a week later. Therefore, for 2007, Reunion Weekend will be held from June 1-3, 2007.
fter spending a year with the title "Past President" beside his name, Scott R. Baker '94 has once again assumed the role of president of Alumni Council. He has stepped up to take the place of the previous president-elect, who resigned due to family reasons immediately before the council's May meeting. Given the sudden vacancy, the council asked Baker, who served as president for the 2004-05 term, to step back into the leadership role for 2006-07. A veteran volunteer for Kenyon, Baker has advised the Office of Alumni and Parent Programs on its alumni online community, including its homepage, alumni directory, and class and regional pages. His designs have also been used on the cover of Chamber Singers CDs. During Reunion Weekend 2005, he appeared in "A Short History of Kenyon," a theater production he cowrote with Chris Barth '93 . Here's another triple-charged idea connecting you to Kenyon: Giving in Threes. You make your reunion pledge a year in advance of your class reunion. Once you've pledged, you make your gift over the course of three years--and the entire gift counts toward your reunion class total. You get to plan a gift in celebration of your Kenyon education, your Kenyon class, and your Kenyon reunion--a gift of even greater scope and meaning. Once you make a pledge, solicitations stop for three years. You will no longer receive annual appeals. You have plenty of time to fulfill your pledge, and you can specify your pledge payments to suit your financial needs. Giving in threes provides the foundation for a stronger Kenyon Fund, and thus a stronger Kenyon. Your three-year pledge is a source of vital support for the College. But it's much more. It's also a way of reaffirming relationships--between you and the Kenyon you love, between you and the classmates you cherish, between you and future Kenyon generations. That's the power of giving in threes. 1953 photo of a group gathered around the table in the Peirce Hall coffee shop, published in the Winter 2006 Bulletin , looked "eerily familiar" to Anne Morrissy '01 . It "was almost identical to one I took in 2001, with a few fashion details changed," Morrissy wrote. "I guess at Kenyon, it's true that the more things change, the more they stay the same." Submissions of photographs that capture those uniquely Kenyon moments are always welcome. 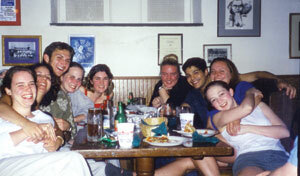 Fill your photo albums at alumni.kenyon.edu, or send them to us directly. Contact Jill Shriver in the Office of Alumni and Parent Programs at shriverj@kenyon.edu. John Rinka '70 for his induction into the Ohio Basketball Hall of Fame as part of its inaugural class. Rinka was a star during his four years in Gambier, and his 3,251 career point total still ranks tenth all-time in National Collegiate Athletic Association (NCAA) basketball history. Rinka (center) is flanked by Kenyon President S. Georgia Nugent and board of trustees chair William Bennett. Head Men's Basketball Coach Matt Croci (far left) and former coach Bob Harrison (far right) also attended the induction ceremony along with Rinka's former teammates John Dunlop '69, Tim Delaney '72, Richard Fox '68, Kit Marty '69, Terry Parmelee '68, and Ruben Pope '70. Kenyon brought you together with people who changed your life. And Kenyon still brings you together, in lots of ways. Reunion. The Alumni Bulletin. The Web: www.kenyon.edu. And The Kenyon Fund . The Kenyon Fund makes a difference for everyone, by bolstering the relationships that shape the Kenyon experience in every generation. Your gift to the Kenyon Fund plays an absolutely vital role in the life of the College. Give online at http://gift.kenyon.edu .